2014 ‘Pop-up Studio’ at The Big Stitch, Ashmolean Museum, Oxford; Fashion, Embroidery & Stitch, NEC Birmingham; ‘Open Studio’ Oxfordshire Art Weeks. 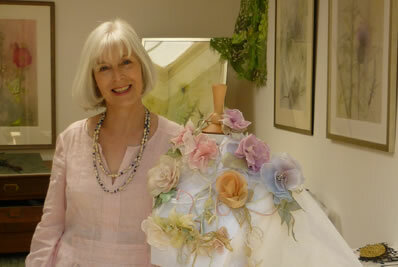 2013 - 'Fashioned with Stitch' - Solo exhibition at The Silk Museum, Macclesfield, Cheshire. 2011 & 2012 - Exhibition, Art in Action, Oxfordshire, UK. 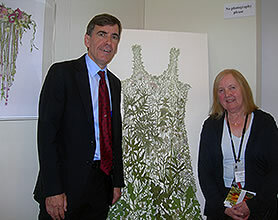 2010 - 'Botanical Paintings & Textile Art', Oxfordshire Art Weeks. 2009 - 'In Studio' weekend residency, linked event for 'A Wearable Art'. 2009 - 'A Wearable Art', The Oxfordshire Museum, Woodstock UK. The heritage setting of The Silk Museum in Macclesfield was the venue for my solo show this summer. The museum offered an inspiring gallery space to display textile work; the historic building was originally the Macclesfield Art School, so artistic pursuits have wafted around its walls for almost 100 years, before it became a museum. Now the museum's collection and archives offer a rich resource for textile artists. In designing and curating my exhibition I wanted to reflect the very essence of my creative world from sketchbook to finished embroideries. Visitors could enjoy displays of 'inspiration material', paintings, drawings, fashion pieces and my embroidered lace panels suspended in acrylic cases. The splendid exhibition cases provided by Annabel Wills (curator of The Silk Museum) were perfect for observing either collections of 'source material', the lace embroideries,or an ethereal group of silk organza capes. Browsing through the visitors book, with its beautiful cover of Macclesfield silk (of course! ), the exhibition comes alive again as I read visitors' comments and know that they have come away inspired, just as I was inspired to create this show. The exhibition attracted lots of visitors from different regions of the UK, plus some overseas visitors on holiday from Australia, Vancouver, and Norway. Now perhaps I need to plan another venue for those who could not make this show! As the workshop on July 20th was fully booked, I added an extra day of demos. The Study Day and class in July was popular; students enjoyed a peek into the museum archives to see examples of machine embroidered lace and sample books, a great treat which Annabel organised. Water soluble techniques were the focus of the practical class, Madeira UK kindly provided water soluble materials for the class. Press coverage included 'Embroidery', 'Stitch', 'Selvedge' and Cheshire Life. I have always enjoyed visiting this annual event in Oxfordshire, to experience the rich diversity of arts and contemporary crafts through the exhibitions and demonstrations. I was thrilled to be selected as one of the 17 demonstrators in the Textiles area; it was an opportunity to show new works and a selection of the samples from my book, 'Embroidered Originals'. The intricacies of machine embroidered lace came to life as I stitched away on my vintage Bernina sewing machine. Visitors could follow my creative journey through collections of inspiration material and botanical drawings into the embroidery pieces. The 'Hidcote Lace' dress panel , featured on my Home Page and Studio Page, was created especially for Art in Action; the stunning red colour palette of the stitched lace reflected a dazzling array of flora which I sketched in the 'Red Border' at Hidcote Manor Garden. Kate Wells, the organizer of the Textiles tent, suggested a theme: 'Common Thread', which also stimulated fresh directions and ideas for our exhibitions. This event marked a double celebration: the opening of Sue's new studio and a book launch for 'Embroidered Originals', published on May 1st. 'Botanical Passions' was a fusion of artworks and embroideries; a collection of Sue's original textiles which feature in her book were on display, against a backdrop of the framed botanical studies. Visitors could enjoy the intricacies of the finely crafted textiles, imaginatively styled on mannequins, with collections of samples displayed in antique plan chests. The inspirational garden setting of the studio reflected Sue's passion for plants, and the essence of themes central to her creative work. The exhibition and book launch attracted nearly five hundred visitors during the week, from Oxfordshire and other regions. A number of the botanical painting were purchased; Sue is currently working on a commission, from the show, for an embroidered lace which continues the 'Viridis' textile series (as featured in 'Embroidered Originals'). Following this event, Sue showed her work and gave demonstrations at Kelmscott Manor in June, and at Art in Action in July (courtesy of Artvango). 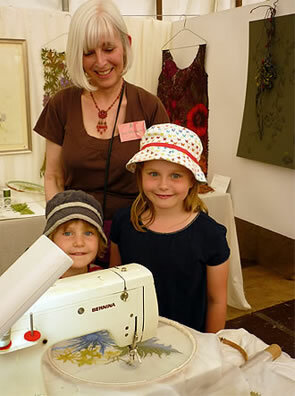 Earlier in May, she gave a talk at the Stroud International Textile Festival. 'A Wearable Art' featured a diversity of contemporary work by fourteen designer/makers, exploring the textural and sculptural dimensions of garments, accessories and jewellery. A fusion of design and craft, the exhibition offered visitors a rich experience of artistic excellence in the 21st century. The language of creativity was central to the 'In Studio' sets; three personal studio spaces were created within the exhibition context: Emily Jo Gibbs- Accessories; Bridget Bailey- Headpieces; Sue Rangeley - Embroidery. Artists were in residence during the weekend of May 16-17; visitors enjoyed a unique dialogue with the makers, enriched by seeing specialist demonstrations. Sue was also 'In Studio' during other weekends, creating fashion embroidery samples for the 'Viridescence' collection , featured in her book: 'Embroidered Originals'. 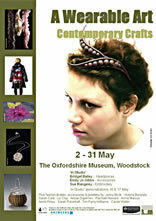 Referencing the heritage of British crafts has featured in previous events, curated by Sue (Contemporary Crafts in the Cotswolds 1997 -2007,for West Oxfordshire District Council); Selected exhibits from the Oxfordshire Craft Collection were displayed within 'A Wearable Art'. Bridget Bailey, Jenny Bicat,Victoria Borondo, Sarah Cant, Liz Clay, Alison Dupernex, Emily Jo Gibbs, Rachael Howard, Annia Marcus, Annik Piriou, Sarah Pulvertaft, Sue Rangeley, Carole Waller, Tim Parry-Williams. David Rutley M.P. with Annabel Wills, Curator of The Silk Museum, standing in front of the 'Wild Flower' lace dress panel, with just a glimpse of the 'Summer of Love' choker. 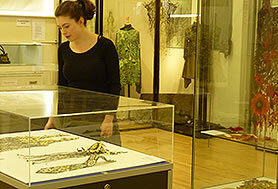 Isabelle observing the 'Monochrome Memories' case (see 'Just Fab' in Autumn 2013 Newsletter). In the background is the 'Wild Wood' room set, and to the right a glimpse of 'Hidcote' lace dress panel. Emily Jo Gibbs demonstrating (2009). © 2010-2013 Sue Rangeley - All images on this Web Site are the copyright of the Artist and, where applicable, the photographer. 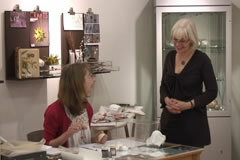 Sue Rangeley is listed on the Crafts Council Photostore | Web design and development by CODESIGN.